A common way to represent a polygon mesh is a shared list of vertices and a list of faces storing pointers for its vertices. This representation is both convenient and efficient for many purposes, however in some domains it proves ineffective. Mesh simplification, for example, often requires collapsing an edge into a single vertex. This operation requires deleting the faces bordering the edge and updating the faces which shared the vertices at end points of the edge. This type of polygonal "surgery" requires us to discover adjaceny relationships between components of the mesh, such as the faces and the vertices. While we can certainly implement these operations on the simple mesh representation mentioned above, they will most likely be costly; many will require a search through the entire list of faces or vertices, or possibly even both. Which faces use this vertex? Which edges use this vertex? Which faces border this edge? Which edges border this face? Which faces are adjacent to this face? To implement these types of adjacency queries efficiently, more sophisticated boundary representations (b-reps) have been developed which explicitly model the vertices, edges, and faces of the mesh with additional adjacency information stored inside. One of the most common of these types of representations is the winged-edge data structure where edges are augmented with pointers to the two vertices they touch, the two faces bordering them, and pointers to four of the edges which emanate from the end points. This structure allows us to determine which faces or vertices border an edge in constant time, however other types of queries can require more expensive processing. The half-edge data structure is a slightly more sophisticated b-rep which allows all of the queries listed above (as well as others) to be performed in constant time (*). In addition, even though we are including adjacency information in the faces, vertices and edges, their size remains fixed (no dynamic arrays are used) as well as reasonably compact. These properties make the half-edge data structure an excellent choice for many applications, however it is only capable of representing manifold surfaces, which in some cases can prove prohibitive. Mathematically defined, a manifold is a surface where every point is surrounded by a small area which has the topology of a disc. 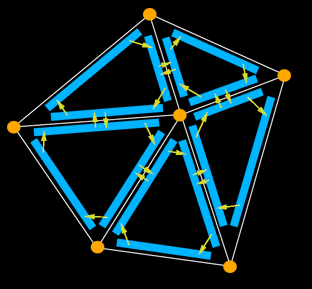 For the purpose of a polygon mesh, this means that every edge is bordered by exactly two faces; t-junctions, internal polygons, and breaks in the mesh are not allowed. (*) More precisely, constant time per piece of information gathered. For instance when querying all edges adjacent to a vertex, the operation will be linear in the number of edges adjacent to the vertex, but constant time per-edge. The half-edge data structure is called that because instead of storing the edges of the mesh, we store half-edges. As the name implies, a half-edge is a half of an edge and is constructed by splitting an edge down its length. We'll call the two half-edges that make up an edge a pair. Half-edges are directed and the two edges of a pair have opposite directions. The diagram below shows a small section of a half-edge representation of a triangle mesh. The yellow dots are the vertices of the mesh and the light blue bars are the half-edges. The arrows in the diagram represent pointers, although in order to keep the diagram from getting too cluttered, some of them have been ommited. Note that in these iterating examples checks for null pointers are not included. This is because of the restriction on the surface being manifold; in order for this requirement to be fulfilled, all of the pointers must be valid. Other adjacency relationships can be quickly found by following these examples. K. Weiler, "The Radial-Edge Structure: A Topological Representation for Non-Manifold Geometric Boundary Representations", Geometric Modelling for CAD Applications, North Holland, pp. 3-36, 1988.